Quadriga is a web-application that acts as a clearing-house for text annotations -- in the form of contextualized triples, or “quadruples,” that form complex graphs -- generated with the Vogon desktop application, and as an environment for managing text-annotation projects. Quadriga relies on a central authentication system for user authentication, a dictionary service (Wordpower) and an authority file service (Conceptpower). Quadriga can connect to a DSpace repository, allowing users to select items stored in the repository for annotation. Quadriga can use standard graphs to map quadruples onto conventional semantic graphs that can be submitted to a triple store, and used for interactive websites and visualizations. Quadriga uses the Spring Framework, a MySQL database, and can be deployed in a servlet container such as "Tomcat." You can find installation details here. 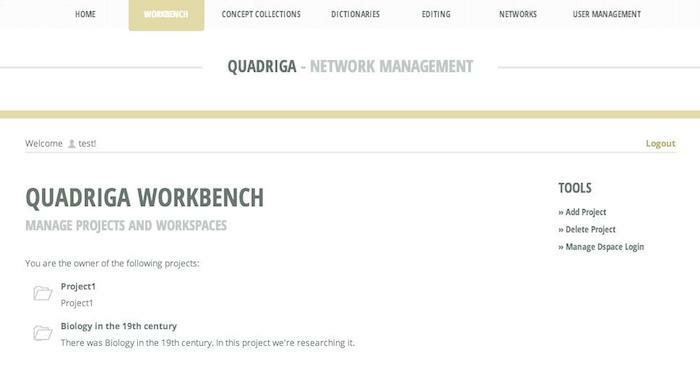 Quadriga is being developed by the Digital Innovation Group (DigInG) at Arizona State University. © 2014 Digital Innovation Group. All Rights Reserved.